Uterine Fibroids are benign (non-cancerous) growths in the wall of the uterus. In many patients they do not cause any symptoms but some patients experience irregular vaginal bleeding, pain, bladder and bowel symptoms and distended bellies. In these ladies, treatment of the fibroids may reduce their symptoms. Who makes the decision for treatment? There are various treatment options available and your GP or gynaecologist will advise you on the best option for you. You will usually have a pelvic ultrasound first, to confirm you have fibroids. Following this, you will have an MRI scan to assess the size and position of the fibroids on your uterus. Who will be doing the Uterine Artery Embolisation? A specially trained Radiologist called an Interventional Radiologist will perform the procedure. How do I prepare for Uterine Artery Embolisation? You will be prepared for an operation and will be kept nil by mouth for 2 hours prior to the procedure. 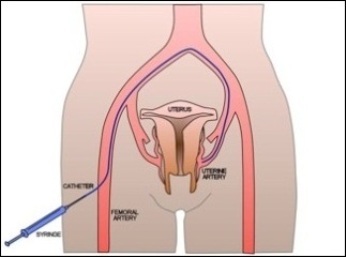 What happens during Uterine Artery Embolisation? You will have a needle or cannula put into a vein in your arm, so that the nurse can give you sedation and pain killers. You will have a urinary catheter placed in your bladder so that you don’t have to go to the toilet during or after the procedure. You will lie on the x-ray table. The Radiologist will inject some local anaesthetic into the skin over your femoral artery (over your hip) and pass a guide-wire through your arteries. 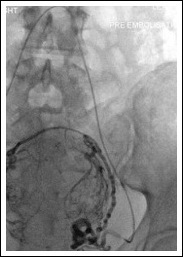 Special tubes called catheters are directed inside your arteries to the Uterine Arteries. These are then blocked using special particles (embolisation spheres). At the end of the procedure, the Radiologist will remove the catheter from your artery and apply pressure on your groin for about 10 minutes to prevent any bleeding. Some discomfort may be felt in the skin where the needle is placed. Your will have pain killers administed via a pump which you will control yourself (patient-controlled analgesia). This will stay on for several hours after the procedure. When this is disconnected, you can have pain killers by mouth. You may continue to feel discomfort in your pelvis similar to bad period pains, for up to 2 weeks following the procedure. You will be kept in hospital overnight and most patients go home the following day. Every patient’s situation is different, and it is not always easy to predict how complex or how straightforward the procedure will be. As a guide, the procedure usually takes about 30 minutes. You will be taken back to the ward. Nurses will carry out routine observations, such as taking your pulse and blood pressure, to make sure that there are no problems. They will also look at the skin entry point to make sure there is no bleeding from it. You will generally stay in bed for a few hours, until you have recovered. Most patients are allowed home the following day. Uterine artery embolisation is a safe procedure, but there are some risks and complications that can arise. There may be bruising around the groin following the procedure. There may be complications if the fibroid impacts in your uterus. Your Radiologist will discuss these risks with you before the procedure. An MRI scan will be performed 6 months following your fibroid embolisation. This is to check the fibroids have got smaller and are no longer well perfused. Your will also be seen by your Radiologist at this time.